‘یہ ہو گا جب وہ ایک مذہبی آدمی کو مار دیں گے’ (This will happen when they will kill a religious man) – This was the overall thinking of some section of the society when a local Islamic cleric who used to head the Lal Masjid was killed by Pakistan Army on waging war against the state of Pakistan on July 10, 2007. Now the question is what lead to this thinking and what really happened after his death? Right after his death, to be more precise after four days, a deadly windstorm gripped Islamabad on July 14 followed by torrential rainfall that brought homes down, billboards to fly, tree and poles to be uprooted in many cities of Punjab that included Sargodha, Sahiwal and Toba Tek Singh. Nature’s wrath followed by Operation ‘sunrise’? 109 people dead in the Army operation while 200+ were injured according to the BBC till July 10, 2007, the death toll consisted of children and women. The Kala-tufan (Black Storm) dubbed by the locals, started on July 14. 2007 from 5:00 pm PKT till 11:00 pm PKT, the winds were about 148 kilometer per hour (92 miles per hours) with heavy rainfall of 50 mm. After the scattered destruction in Punjab, some people were quick to blame their sins for this event which is quite common after unusually powerful strong weather events. Few people that were questioned by the press said, “This will happen when they (Pak Army) would kill a religious man (Abdul Rashid Ghazi).”, pointing towards Lal Masjid operation. Nothing unusual, just normal thing happening! Such magnitude of storms are not at all unusual especially in the months of May, June and early July in Punjab and Khyber Pakhtunkhwa, when the heating of soil moisture is responsible for the strengthening of western thunderstorms. However in July 2007, a monsoon depression was moving towards north-eastern Punjab that originated from the Bay of Bengal as a western disturbance was present over the northern areas. 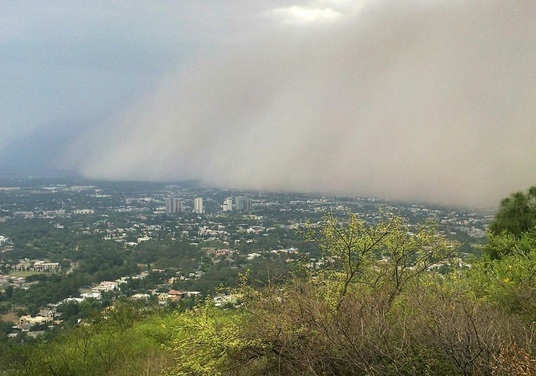 Earlier in the same year in June down south, Pakistani coastal city of Karachi also experienced a similar windstorm followed by a torrential rainfall that gripped the city for one week due to Cyclone Yemyin. 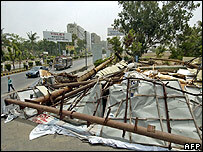 On June 23, 2007 a windstorm of 111 km/h devastated the city of Karachi bringing monstrous hoarding and billboards to the ground, people while talking to the press said that they have never seen such a magnitude storm in the history of the metropolis. However that same thinking that has been discussed above was also witness in Karachi at that time; On June 25 night on ARY News, few religious clerics said, “Only those billboards came down which contained vulgar images”, other said, ‘This is what happens when you put pictures of women” It is worth-noting that after this storm, the Mayor of Karachi Mustafa Kamal ordered the removal of billboards and shortening in their sizes while the pictures of women were also removed. So it is really Nature’s wrath? This post is not criticizing anyone’s thinking or targeting any school of thought, the message of the article is that ‘not all’ climatic events are wrath of God or a punishment for our sins. For instant, weak hurricanes in India and Pakistan kill 100 to 500 people while much stronger hurricanes in America kill 20 to 50 people, why? because they are prepared for every disaster however there are some events that come without warning or any prediction that can be termed as a punishment by God like the 2011 and 2004 tsunami, 2005 Kashmir Earthquake, 2010 Pakistan floods or Hurricane Katrina because all of these events were unusual and rarely occur! ← Division – Kashmir Heaven axed by Devilish LoC! Pak Army done correctly against Red Mousque..! Whenever someone challenges the state, they are considered an enemy of the state, so yes Lal Masjid operation was a must (my personal view) however this post was about the media’s response to the windstorm that occurred after few days of the operation. The Lal Masjid declared war/Jihad against Pakistan. These are actions of Khawarij as told in Islam by Holy Prophet SAW. So Army did 100% right to counter them. It does not matter if there was a storm for some time, a more shocking and similar event happened when Masjid-Al-Haraam was seiged by similar types of fanatics in 1979. A military assault was done in Masjid-Al-Haraam to clear it from those kharijis. Yes you are right, the post is highlighting the thing when media compared the storm with the operation which is silly and immature. Lal Masjid Operation was a Great blunder by the army and army has admitted this. Musharraf has said many times that his biggest mistake was that operation which made him ZERO from HERO…..
Army never admitted that Lal Masjid operation was a blunder. In fact, just recently Musharraf has said that he wont apologize for the operation and on oath claimed that no girl-students or girls were killed. Extract of Hadith: says that fight the kharijis who will emerge in Muslim Ummah and will spread fasad and bloodshed in the name of Islam. 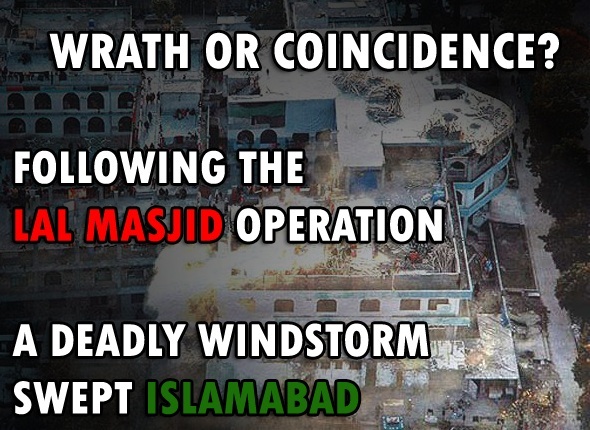 So, Pak Army will continue the war with the kharijis of Lal Masjid and Al-Qaeda. Thank you Waseem as always.. I had a respect for Pak.Army ! but then the blood of shaheed of Lal masjid …every brick calls to the day for the autrocity it experienced…Army men marching into masjid with boots on. Martyring the very mujahid on the very pure floor ! this wont go waste! KHILAFAT RAIJ HOGI ! AUR YEY BAAT PAKISTAN KI HUBL WATNI KAILIYAY kahtay hain ! Ghazi teri jura’at ko salaam! 2007 was an astonishing weather year in the country, almost all parts of Pakistan witnessed extreme weather events.